A whole lamb leg consists of two separate cuts – the sirloin and shank - usually with two large bones. Because the sirloin portion of the leg is naturally tender and the shank portion is not, cooking the meat at a low oven temperature for a long time is the best way to ensure the entire lamb leg cooks up tender and juicy. 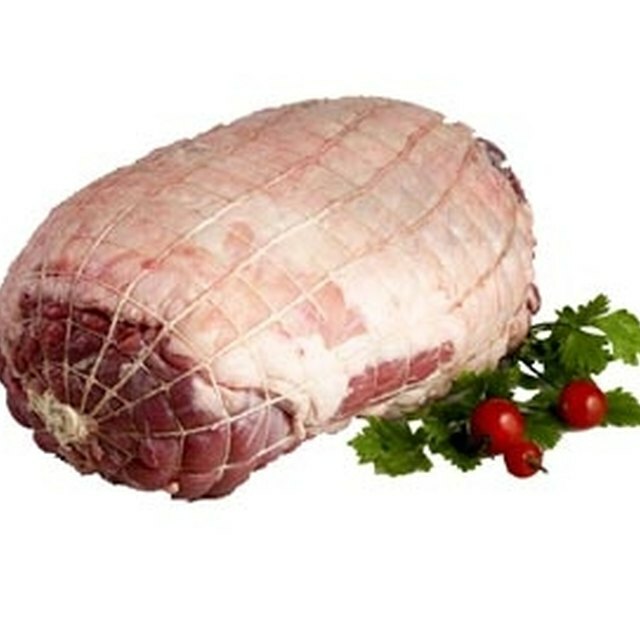 Lamb is a source of protein, vitamin B12, zinc and iron. Cooking lamb leg with fat and sodium-free seasonings increases its flavor while preserving its solid nutritional value. Trim all visible fat and the top, papery covering called the fell, with a sharp knife. Baste the lamb leg with olive oil or substitute lemon juice for a slightly sharper taste. Cut a series of two-inch slits in the surface of the lamb leg. Divide the garlic slices evenly and place an equal amount into each slit. As an alternate option, rub minced garlic over the uncut surface of the meat. Combine the dried oregano, thyme and black pepper in a small bowl. Sprinkle or rub the seasonings evenly over the surface of the meat. Preheat your oven to 350 degrees F. Set a rack in a shallow roasting pan and then center the lamb leg on the rack. Roast the lamb leg using 20 to 25 minutes per pound as a guide. After the first hour of cooking, add water to the bottom of the pan. 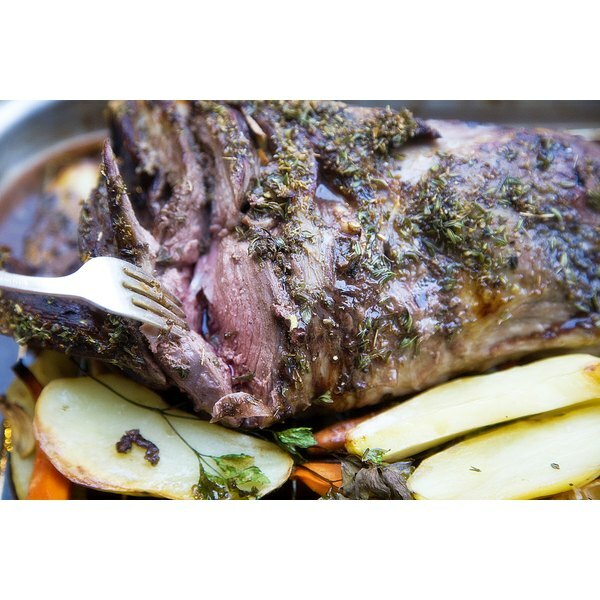 Remove the lamb from your oven when a meat thermometer indicates the lamb is 160 to 170 degrees F. This temperature range is medium. Transfer the lamb leg to a serving platter with a wide metal spatula. Cover the meat loosely with aluminum foil and let the meat juices reabsorb into the meat for 15 minutes before slicing and serving. To add a dark brown crust and increase flavor, cook the lamb leg at 400 degrees F for the first 30 minutes of roasting. Cool the cooking liquid in your refrigerator for about 10 minutes to solidify fat drippings. Skim the fat from the liquid with a wide, shallow spoon before reheating in a saucepan and serving with the meat.